Little boys are like monkeys - they are playful and happy, ready for mischief and fun! At least that's how I like to imagine monkeys... fact is, the only monkey I've ever met/seen is at Mckee's Pet Shop and it's a mean old thing! It scrunches its nose at you and looks like its cussing you out. 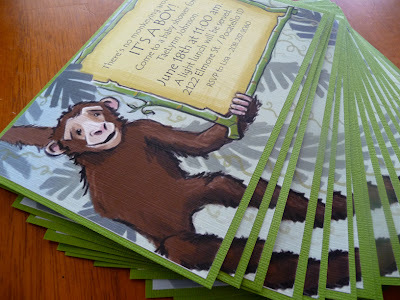 But that's beside the point.... this is about a cute little monkey invitation to a baby shower! My sister-in-law is due in July and we're having a shower for her soon. I was happy to make her invitation and it was a fun little project. Her little monkey will probably pop out with a head full of dark hair! Can't wait to meet the little guy! aw, this is adorable! I think they are wonderful! Love love love times a million!